Every meal has a story. Whether it’s to fuel you for a family road trip, or indulging in the chocolatey goodness of a Frosty, let us keep you and your family satisfied. We understand nutrition and health are important to you, and it should be. At Wenco Wendy’s restaurants, we take the privilege of serving you seriously. Often, people disregard a quick service restaurant to being just a fast meal. At Wendy's, we take care of you in a timely manner because your experience is important to us. We seek individuals who are leaders and want to make something of themselves. A job at our stores has advancement opportunities. In other words, we’re a place you can grow into. Not everyone’s needs are the same, we understand that. This is why we offer flexibility and work with you to find your perfect role within our company. Your character should play into your career, define yours at Wendy’s. Join our team to make a difference in the community and be a part of something bigger than yourself. If you're on the road or want a quicker dinner option with value, find your local Wendy's and enjoy your delicious food. Life doesn't stop just because you're clocked in. This isn't just a job, but a bold career move that provides competitive pay and flexible hours. Apply today! Our food is fresh, always. We care about your health because we care about you. See our nutrition facts for all of the information you need to maintain a healthy diet. Take Wendy’s natural cut fries and add cheddar and a creamy cheese sauce. 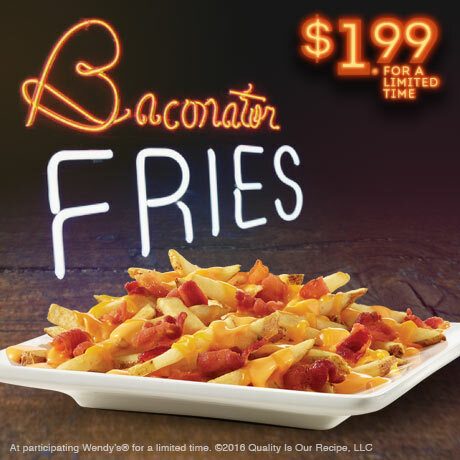 Top it with thick cut applewood smoked bacon (cooked in an oven of course) and you have fries worthy of the name Baconator. Carry Wendy's® with you wherever you go. With the Wendy's™ app, you can view your Wendy's favorites by category, including juicy, Old Fashion Hamburgers®. Looking for a lighter option? Enter your target calorie range to browse prebuilt meal option to fit your lifestyle. Once you've built an appetite, use the Wendy's™ app to find a Wendy's near you. You can even load funds and pay with mobile at participating Wendy's locations. Hot because it's made to order. 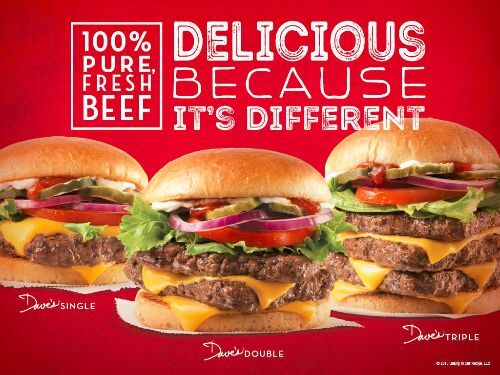 Juicy because it's 100% beef. Dave's because, well, that's the way he wanted it.